with the use of these high-energy and high-power systems. This report and the supporting work was sponsored by the Mineta National Transit Research Consortium (MNTRC) under a University Transportation Centers grant from the U.S. Department of Transportation Research and Innovative Technology Administration, with matching equipment and supplies provided by a manufacturer of advanced chemistry cells. Follow the Learn More button below for a copy of the report. Temperature and votlage data was recoreded during all tests associated with this work. Videos and images were also captured before, during and after each test. The future of mass transportation is clearly moving toward the increased efficiency and greenhouse gas reduction of hybrid and electric vehicles. With the introduction of high-power/high-energy storage devices such as lithium ion battery systems serving as a key element in the system, valid safety and security concerns emergeare presented. This is especially true when the attractive high- specific- energy and power- chemistry, lithium nickel cobalt aluminum oxide (NCA), is used. This chemistry provides great performance but presents a safety and security risk when used in large quantities, such as for a large passenger bus. If triggered, the cell can completely fuel its own fire, and this triggering event occurs more easily than one may think. To assist engineers and technicians in this transfer from the use of primarily fossil fuels to battery energy storage on passenger buses, the Battery Application Technology Testing and Energy Research Laboratory (BATTERY) of the Thomas D. Larson Pennsylvania Transportation Institute (LTI) in the College of Engineering at The Pennsylvania State University partnered with advanced chemistry battery and material manufacturers to study the safety concerns of an NCA battery chemistry for use in transit buses. The research team ran various experiments on cells and modules, studying the rarely considered thermal events or venting events. Special considerations were made to gather supporting information to help better understand what happens, and most importantly how to best mitigate these events and/or manage them when they occur on a passenger bus. The research team found that the greatest safety concern when using such a high- energy chemistry is ensuring passenger safety when a cell’s electrolyte boils and causes the ventilation of high-temperature toxic material. A cell ventingcell-venting event can be triggered by a variety of scenarios with differing levels of likelihood. Also, though the duration of a venting event is relatively short, on the order of just a few seconds, the temperature of the venting material and cell is extremely high. During a venting event, the high-pressure, burning gases tend to burn holes in nearby packaging materials. Most interestingly, the team discovered that following a venting event the large-format cells tested immediately reached and remained at extremely high external skin temperatures for very long periods, on the order of hours. 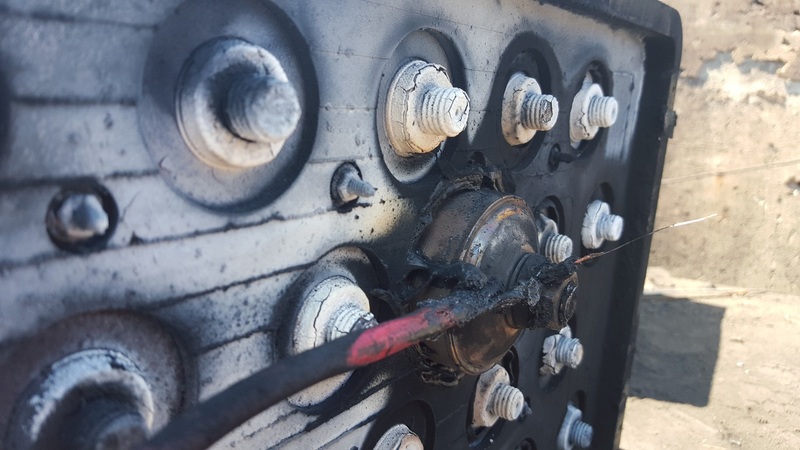 The majority of this report covers the testing designed to better understand how high-energy cells of this chemistry fail and what materials can be used to manage these failures in a way thato increases passenger survivability.